Designed by Sylvie de France, this catalytic lamp has a soft and generous shape. 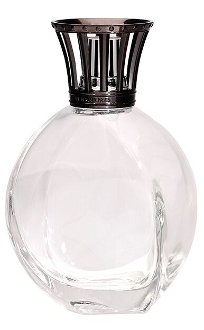 The twisted lines enhance the natural lustre and transparency of the glass. Associated with its pearl mounting in gunmetal grey, this fragrance diffuser will add a feminine touch to your interior decoration. Lamp sold in a very pretty box with protective pouch. Enjoy FREE UPS Ground shipping on any order over $135! Most orders placed weekdays before 3:00 PM CST will ship out the same day!